Liverpool have the advantage after holding Arsenal to a draw in the Champions League quarter-final, first leg at The Emirates. 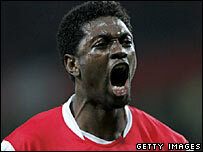 Emmanuel Adebayor headed Arsenal in front in powerful fashion from Robin van Persie's cross after 23 minutes. 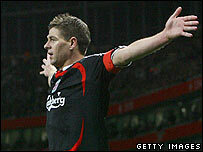 Arsenal's lead lasted only three minutes before Steven Gerrard set up Dirk Kuyt to score from close range. The Gunners had a clear penalty appeal turned down after the break when Kuyt hauled back Alexander Hleb in the area. Arsenal were the better side over the 90 minutes but Liverpool will hope the trademark Anfield atmosphere will help them into the semi-final for the second successive year after Kuyt's crucial away goal. But the tie remains in the balance and Arsenal boss Arsene Wenger will believe his side showed enough to suggest they can also grab a goal at Anfield next Tuesday. Liverpool keeper Pepe Reina gave his side an early scare when an ill-judged dash from his goal resulted in him missing Cesc Fabregas's through ball but he recovered to block Adebayor. Abedayor's strike partner Van Persie wasted a glorious opportunity after 20 minutes when he was picked out by Mathieu Flamini's through ball but he lifted a left-foot volley over the bar. There was no escape for Liverpool when Arsenal took a deserved lead three minutes later through Adebayor. Van Persie worked a short corner routine with Fabregas and crossed for Adebayor, who rose to head home, with Sami Hyypia hopelessly flat-footed and Reina helpless. The home side's lead lasted only three minutes when Gerrard took advantage of some feeble challenges to drive into the area and cross for Kuyt to bundle home from inside the six-yard box. Arsenal boss Wenger was forced into a change for the second half, when Theo Walcott came on to replace the injury-cursed Van Persie, who had suffered a left thigh problem in the closing stages of the first period. And they almost had a bigger problem after 47 minutes but keeper Manuel Almunia saved well low down from Kuyt after Arsenal had failed to clear Gerrard's free-kick. But Walcott gave the Gunners hope when he cut inside and unleashed a drive from 25 yards that flew just wide. It prompted Liverpool into a change after 57 minutes when Yossi Benayoun was sent on for the disappointing Ryan Babel. Arsenal had picked up the pace and Martin Skrtel needed to be well placed to smuggle Emmanuel Eboue's shot off the line. Liverpool had an amazing escape after 65 minutes when Kuyt clearly dragged Hleb back by the arm as he raced into the area but Arsenal were understandably furious when Dutch referee Pieter Vink ignored their appeals. Substitute Nicklas Bendtner then unwittingly cleared a Fabregas shot off the line but he had already been ruled offside. Arsenal: Almunia, Toure, Gallas, Senderos, Clichy, Eboue (Bendtner 67), Flamini, Fabregas, Hleb, Van Persie (Walcott 46), Adebayor. Subs Not Used: Lehmann, Diaby, Song Billong, Silva, Justin Hoyte. Liverpool: Reina, Carragher, Skrtel, Hyypia, Aurelio, Mascherano, Alonso (Lucas 76), Kuyt, Gerrard, Babel (Benayoun 57), Torres (Voronin 85). Subs Not Used: Itandje, Riise, Crouch, Arbeloa. BBC Sport Player Rater man of the match: Liverpool's Steven Gerrard 7.80 (on 90 minutes).